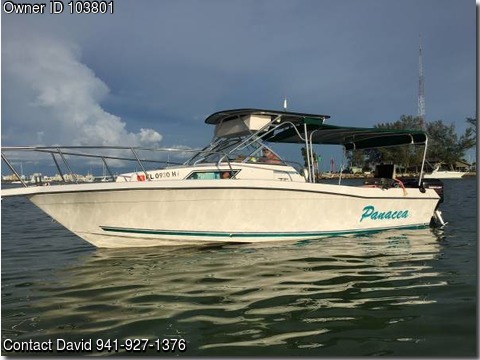 Boat is located in Sarasota,Fl.Please contact the owner @ 941-685-4533 ... 9' beam 25' hull Counter Rotating Twin 2.4 Mercs Stainless Mirage Solid Hub Props / Stainless Marine Bracket with dive ladder Wide walkaround, deep freeboard / Delta bottom / LOA 32'/150 gal fuel / 50 gal fresh water / F&S water shower /Windlass, Danforth Anchor 600' 5/8 line / Galley with sink & alcohol stove / Head area / Holding tank never used / Hard top with custom radio box. Electronics Include: Sitex GPG, Depth finder, Horizon VHF, AM/FM/CD player/1750 Watt Invertor 2500 KW Portable Generator / Deck mount AC / Custom Battery Switch System, 3 Deep Cells, dedicated house battery with battery Isolators / Guest 15Amp Charger / Stern anchor / Stainless Gas Grill 2 burners / Custom Cockpit Bimini is Removable Alumihauler Trailer/Triple Rolls Axles replaced all bearings replaced 2016 Well Maintained: 2010 new gauges 2011 New Tiller arms assys. Replaced with Stainless Steel 2011 Power heads rebuilt 2013 New External Engine parts: Fly Wheels, Stators, Trigger assys, Starters, Switch boxes, Idle stabilizers, Coils, Trim & Tilt solenoids 2013 Rebuilt lower units 2016 Insulated Hard top & Insulated Custom Cockpit Canvas Sunbrella 2017 New water pump impellers Extra set of Stainless Mirage Props / 2 Newer 125 qt Igloo coolers / 4 Sunbrella covered deck chairs plus many extra parts Garage kept since 2003 Solid Hull typical wear & tear. Great Offshore Boat or just relax & Camp on the Hook Sea Trial to Serious Buyers.